Choosing a Siberian Husky was A BIG mistake. Gue sampe terpaksa senyum-senyum sendiri ngebaca Siberian Husky’s Breed Profile ini. 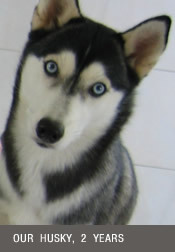 Husky banged gitu loh…!!! Siberian Huskies are vocal. They rarely bark, but will whine, or moan, and also chirp and howl. Head held high, they will produce one of the most haunting song like sounds. But well, she will be 2 years on this September. Life commitment, eh?